A domain name is an address which directs you to a specific location on the internet. It can be a website, an email, the location of a document to download, etc. Look at it this way; if your website was a house, then your domain name would be its address. As an circus artist or circus-related business, owning a domain name is not only the best way to start developing your online presence and identity, but also the most coherent and reliable approach to manage your professional contacts. The reason is very simple; no matter your email addresses or providers, your social media profiles, phone numbers or even physical address, your domain name doesn’t have to change and can be connected to any of them. This means that even if you move to another country, get a new mobile number or your favorite email provider ceases; Anyone you shared your domain name with (and/or email branded with your domain name), will be able to continue communicating with you (and you with them), as if nothing has changed. Your domain name is your online identity while your website defines your personality. It tells us who you are, what you do, what you have done, etc. I often get asked “Do I really need a website?” If you are a professional, the short answer is yes! Your website is your “home” on the internet, the central (and only) place which can connect to all your social profiles and other online activities while offering curated content which you are in complete control of. But it is important to understand that websites also have their limitations. Although all your social media profiles cannot replace a website, a website cannot replace your social media presence either. Let’s take the example of Circus Talk. When you are involved in such community, the benefits it gives you – exposure, job opportunities, creating connections, etc — cannot be made with a portfolio website. That said, with our fast changing technologies and all the existing social platforms, things can quickly get confusing. Although casting agents and other recruiters may discover you on social platforms, a website is what they refer to when seeking or proposing talents because it is the only place where everything is (or should be) about the artist and not mixed or drawn within multiple online platforms. So don’t create a website with thousands of pictures or videos and a 7-page long Curriculum Vitae, it’s confusing. Make sure your website is simple to use and straight to the point, and that it showcases your work, your skills and a way to contact you. An example of a branded email address is: info@YourDomainName.art, contact@YourDomainName.com, etc. A branded email address provides you with a professional identity within your network. I experienced first hand the lost of many contacts because their information changed. Of course you can find people through Facebook, but be aware that no agent or recruiter will take the time to seek your information that way. If you don’t have a website, or at least a branded email, as opposed to just using a gmail account for example, for most, you just aren’t professional enough. Of course, how professional you are as a performer has nothing to do in reality with your web presence, but unfortunately in today’s world, before you compete again another very talented artist, you have to compete against talented marketers! So learning to present yourself is very important. That’s one of the reason why I created Aïkigi Web, to simplify, as much as possible, the management of one’s online identity while remaining affordable. There are many ways to setup a branded email address but if you already have a hosting account with a website and SSL certificate (an SSL certificate secure the connexion to the server with host your website and protects the information exchanged over the internet), chances are you can get email addresses for free through your control panel. Of course, they have limited functionality, but if connected with other mail software (Outlook, Apple Mail, etc) then it should be more than enough for most people. Domain forwarding is the process to redirect your domain name URL to another location on the internet (another URL). The idea is simple; for example, if Circus Talk is your go-to profile when promoting your work, you can configure your domain name to forward all traffic (every time someone enters your domain name) to your Circus Talk profile. It is a small trick which is very useful. If you change you primary location to promote your work (Instagram, Facebook or a website), all you have to do is update the redirection to the new location. You can even create multiple and easy to remember URLs–each forwarding to a specific location. For example, you can have CircusTalk.yourdomain.com redirected to your Circus Talk profile. Check out mine. Same for Instagram.yourdomain.com or LinkedIn.yourdomain.com. That way, it doesn’t matter if your artist name is available as a username on your chosen social media or not, you can keep everything simple and even add those links to a business card. Domain and subdomain forwarding can be created within your domain registrar and/or web hosting account, but each provider has different systems, so you will have to search their documentation or ask their support team if you need help. It is important to note that when buying a domain name, except if you are from Europe, your personal information is public! This is because the internet was created originally as a free and open platform. Unfortunately, many are taking advantage of it for marketing purposes, meaning that when buying a domain name, you will receive many (often hundreds…) of emails and even phone calls from companies to offer you web related services. Fortunately, there is an easy way around that. When buying a domain name, you can also add “Privacy Protection”. Doing so will hide your personal information from the public and keep you out of spam marketer’s radar. I can’t recommend enough the importance of the Privacy Protection! As a professional in the circus industry, a domain name is your best ally. I hope this introduction about the benefit of having a branded domain name helps you better understand why and how it can benefit your professional presence on the internet. 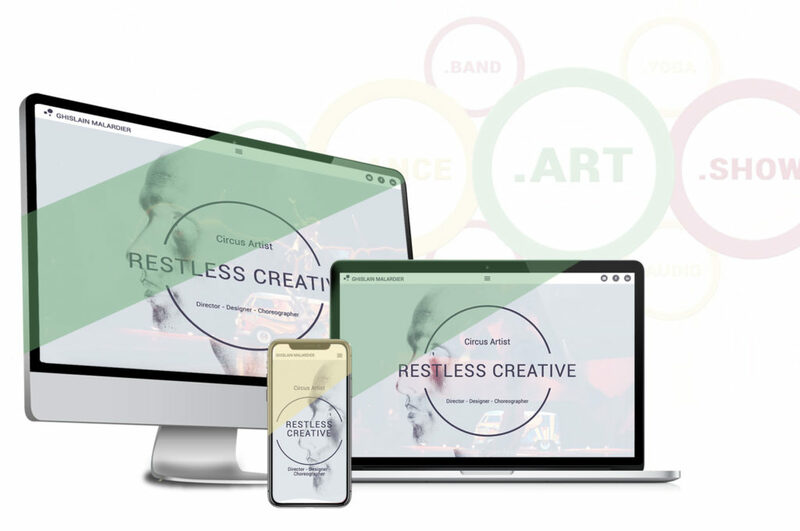 With all the new domain extensions available such as .Dance .Art .Band or .Show , I’m certain you will find your perfect domain name to connect to your field –I just wished .circus was available! You can check if your favorite domain name is available on my website. If you have questions about domain names, or any other website related topics, feel free to contact me. Stay tuned for my next article about the importance of having a professional website! Former Russian Swing circus artist, Ghislain developed a passion for other art forms such as dance, acting and show conception/choreography while studying at the National Center of Circus Art in France. 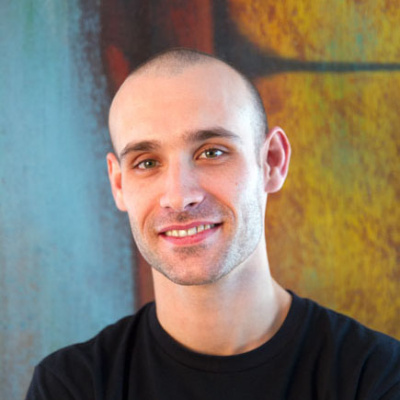 Along his professional journey with Philippe Decouflé (DCA company) in France, Les Ballets Ballet C de la B in Belgium and the Cirque du Soleil in Las Vegas, he discovered and developed other skills such as photography, videography, and finally Web Design. Ghislain is now the founder of Aïkigi Web, a company dedicated to assist artists in the development of their online identities.